(CNN) -- Australian opener Phillip Hughes rewrote the record books in Durban on Sunday when he became the youngest player in history to crack a century in both innings of a Test match. Hughes hits a six on his way to becoming the youngest player to hit a century in both innings of a Test match. The 20-year-old helped the tourists into an almost unassailable position in the second Test against South Africa as they ended the third day at 292 for three with an overall lead of 506. Hughes was unbeaten on 136 at the close having enjoyed strong support from Ricky Ponting after the captain contributed 81 as Australia pounded the Proteas. 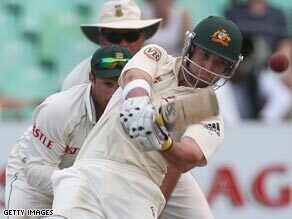 Michael Clark was the other unbeaten batsman on 14, with the only other Australian wickets to fall on the day being Simon Katich (30) and Michael Hussey (19). Peter Siddle earlier claimed the final two wickets without the hosts adding to their overnight total of 138 for seven, leaving them 214 runs behind on the first innings. Siddle followed on the good work done by Mitchell Johnson and Andrew McDonald on day two -- when the pair claimed three wickets each -- by removing the last two batsmen within three deliveries of the resumption. The Victoria paceman struck with just the second delivery when he tempted Dale Steyn to chase a wide delivery that took the toe end of the bat through to Brad Haddin for eight. His dismissal was followed by that of Makhaya Ntini with the next delivery when Siddle's angled ball trapped him in front for a duck, leaving JP Duminy unbeaten on 73 and having not faced a ball on day three. Graeme Smith was the other man not out on two, but the captain was unable to bat after he retired hurt with a broken finger in his right hand. South Africa were also left 15 runs short of avoiding the follow on, but Ponting instead opted to build on their lead with Katich and Hughes raising the half-century stand in just 66 balls. Ponting later reached another milestone when a boundary saw him overtake Steve Waugh's 10,927 career runs to become the fourth highest run scorer in the game. Resuming after tea at 203 for one, Ponting and Hughes quickly raised their 150-run stand, before Morne Morkel's introduction saw him remove the touring skipper with just his third delivery. Hughes then raised his hundred by cutting the same bowler over the slips to surpass George Headley for West Indies against England in 1930 as the youngest man to score a century in both innings of a Test.